The Brown Swiss Association has selected the 2018 Youth Achievement Winner at the Brown Swiss National Convention held in Coralville, Iowa, June 27-30. The National Youth Achievement Winner is an individual who does outstanding work in the Brown Swiss breed. Laura Frye, Logansport, Indiana, is the daughter of Perry and Kathy Frye. From the purchase of 2 Brown Swiss heifers, Miami Hills Farm was developed. She exhibits her Brown Swiss on the local, state and national levels, participates in the classification program and has her herd on DHIA test. 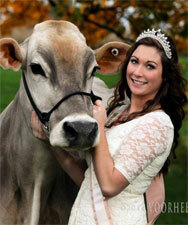 Laura served as the 2014 and 2017 Indiana Brown Swiss Queen and was a finalist in 2015 for the FFA Dairy Production Entrepreneurship Proficiency Contest. She is a junior at South Dakota State University where she is double majoring in Dairy Production and Dairy Manufacturing with a Food Safety minor. In her free time, Laura enjoys riding horses, photography and scrapbooking. To participate in the Youth Achievement contest, a youth must be a Brown Swiss National Junior member as defined by owning or leasing a registered Brown Swiss animal and 16-21 years of age by Jan. 1 of the current year. For more information contact Junior Advisor Skyler DeGroft at sdegroftbscba@gmail.com, call the Brown Swiss Association at 608-365-4474 or visit the website: www.brownswissusa.com. The Brown Swiss Association was established in 1880, registers about 10,000 animals per year and serves about 1800 combined Adult and Junior Members.